Totara is the Maori name for this giant native. It was at one time amongst the most valuable sources of durable timber. With its reddish colour and the fact it is vertually knot free it was sort after for almost every type of building project. Totara grows naturally in lowland and mountain forests from North Cape to South East Otago, but like the Kauri it has suffered at the hand of man and few stands or old specimens remain. The name Podocarpus comes from Pous, Podos-a foot, and Karpos-a fruit, referring to the fleshy stalk that supports the seed pods of many trees in this species. This is the plant sold in most nurseries, the plain green variety is getting harder to find. 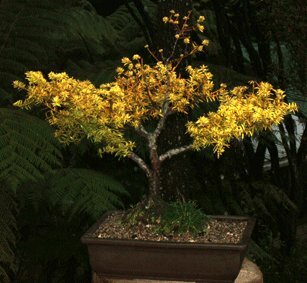 This form is just as good for bonsai and if given a little shade some of the golden colour will fade making it more natural in appearance. Totara is one of my favorite NewZealand native bonsai trees. It is quick growing and branches readily. A quite mature plant can be reduced with a new leader developed to produce a large mature looking tree. The foliage is almost identical in its juvinile stage to its adult form. It is very hardy and will grow in sun or shade. Thick foliage pads can be developed quickly by pinching new growth. Old wood becomes very hard and is difficult to bend, anything up to the size of your little finger should be ok to work with but take it slow they will snap if bent too far. Totara will withstand most things they do not however like wet feet, so a good free draining soil mix and a well made pot is essential. There are few things that will attack a Totara. Be careful with drainage in your pots, try to get a pot with good drainage holes and no pockets especially over the feet for water to pool in. Damage to the roots can allow attack by meally bug which will spread over an unhealthy plant. Spray with systemic insecticide such as Orthene with a small amount of spraying oil added to combat meally bug but also look for the cause of the attack.